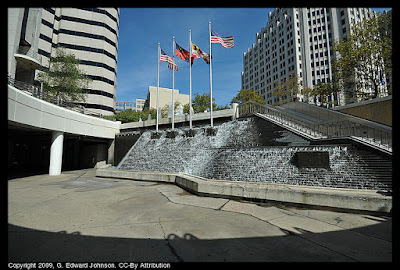 This fountain right at the top of the big escalator at Bethesda Metro Station and by the bus bays is arguably part of the last fountain I highlighted. This fountain is noisy, noisy enough to be heard even when there are idling buses around it. 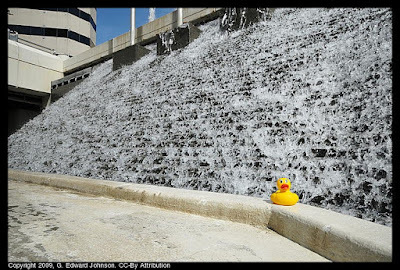 Water cascades over small steps all the way down. It is also very wide. The only minor quibbles I have with it are that it looks like it is missing a flagpole and that the water doesn't quite reach all the way to the right side for the top half of the fountain.